This is the first picture I made that I thought might be of interest to somebody besides me. 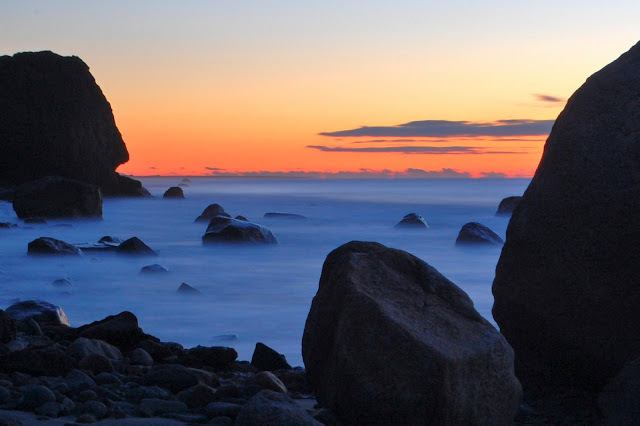 The long exposure gives the surf swirling around the rocks on Lucy Vincent Beach an ethereal effect. I am on this beach two or three times a week in the off-season. It's amazing how different each day looks, with the variables of light, surf, tide, and wind. Erosion has changed it radically since I made this picture. Most of the rocks are gone, and a few new ones have washed up in violent ocean storms. The clay cliff on the left side of the picture has mostly fallen down in a pile of glacial rubble. Purchase this photo (or at least take a look at the price).